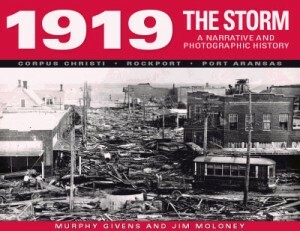 A powerful hurricane devastated Corpus Christi on September 14, 1919. It left an official death toll of 284 with estimates of up to 500 more uncounted dead. Low-lying sections of the city were inundated by up to twelve feet of storm-driven tides. In the downtown, known as the beach section, buildings lining the bay were destroyed or heavily damaged, while the rest of the downtown was flooded with oil-slicked waters. On North Beach, Corpus Christi’s first suburban neighborhood of substantial residences, more than 220 homes were demolished by the storm tide. Those residents unable to reach the safety of high ground were swept into Nueces Bay to battle the storm and debris for their lives. Many died, but some survived the 14-mile struggle across the bay to come ashore at White Point or the Turner Ranch on the back side of Nueces Bay.